Published: March 8, 2018 at 02:56 p.m. Updated: March 8, 2018 at 03:53 p.m. The 2018 free-agent market got some needed juice when the Jacksonville Jaguars opted against placing the franchise tag on Allen Robinson, increasing the possibility that the wide receiver could hit the open market. The football world at large had seemingly all but assumed the Jags would tag the former Pro Bowler to secure his rights for the coming season. And while the two sides could still reach an agreement before free agency officially opens on March 14, you can bet general managers around the league are hoping the highest-ranked receiver on our Top 101 free agents of 2018 becomes available. Jacksonville's decision not to tag Robinson is a curious one. 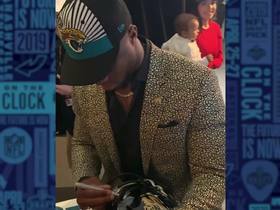 NFL Network Insider Ian Rapoport reported Tuesday that Jaguars decision-makers were hesitant to commit nearly $16 million to a receiver still rehabbing a torn ACL after playing just three snaps last season. Make no mistake: Not applying the tag is a big gamble. Robinson proved in his rookie season he has the ability to run routes and separate from coverage at the rate of an NFL superstar. He followed that promising initial season with 1,400 yards and 14 touchdown catches as a sophomore. He had an admittedly down season in 2016, when he struggled alongside an utterly dysfunctional passer and didn't win as many contested balls as the year before. Next Gen Stats shows he hauled in just 17 of the 50 passes where he had less than 1 yard of separation. But therein lies the true reason for his statistical drop-off in 2016: The Jaguars assigned him far too many low-percentage targets deep down the sideline and rarely used him in the middle of the field, where most efficient passing offenses operate. Robinson could easily rebound in 2018 on a prove-it deal with a team ready to make the leap, a la Alshon Jeffery last season. If this were to happen, the Jaguars would have to answer why they chose not to keep, in my opinion, their best offensive player on a unit that needs a boost as it is. With so many receiver-needy offenses across the league flush with money to spend on an elite perimeter threat, Robinson should have no shortage of suitors. He is the lone player on the market who has handled No. 1 wideout volume for multiple full NFL seasons. So who should pursue the talented pass catcher? Here are my top-five landing spots for Robinson, based on team need and his fit within the offense. Even before the ink was dry on Jimmy Garoppolo's new contract, the conversation turned to what new weapons the team would look to surround their young passer with. Allen Robinson's name was frequently mentioned, and the marriage now appears to be a far more likely reality. The 49ers already have a capable set of receivers in speed threat Marquise Goodwin (who just received a new contract of his own), veteran Pierre Garcon and intriguing slot man Trent Taylor, but they lack a true No. 1 wideout. While each member of the current stable of pass catchers presents a tantalizing set of skills, none of them can dictate coverages while winning outside the numbers or in the red zone the way a prototypical X-receiver can. The 49ers' offense turned into a well-oiled machine under Garoppolo, scoring on 62 percent of their drives -- better than the Patriots' league-high 51 percent over the full season. Yet, while the Niners routinely found a way to get into scoring position, their lack of a true red-zone threat showed up when they got within the 20s, and they too often had to settle for field goals. Garoppolo threw seven touchdown passes on his 45 red-zone throws. That 15.6 percent conversion rate ranked 37th among quarterbacks who threw double-digit passes inside the 20-yard line. Robinson, who hauled in 20 red-zone touchdowns in 2015 and '16, would be an instant upgrade for the 49ers down in scoring position. Robinson would also help Jimmy Garoppolo improve on the one other area in which the passer didn't perform like the second-coming of Tom Brady last season. While Garoppolo ripped teams wide open in the short-to-intermediate area, the team didn't have the big physical receivers on the outside to win down the field. Garoppolo had a 24.3 passer rating on deep throws last year. In his peak season when playing with a functional version of Blake Bortles, Robinson offered unparalleled effectiveness in the vertical game. Bortles had a 102.8 passer rating on deep throws to Robinson in 2015, and the wideout amassed more than 50 percent of his yards on those throws. Even after signing their quarterback to a beefy long-term deal, the 49ers still have a ton of cap space to use. If they want to put the finishing touches on their passing attack, they'll be aggressive pursuing Robinson in free agency. Heading into the offseason, the Panthers look ready to finish overhauling a wide receiver corps that's routinely fallen short of expectations in the later years of the Cam Newton era. They began the process by jettisoning Kelvin Benjamin midseason and successfully installing Devin Funchess as the primary perimeter receiver. Outside of Funchess, the only safe bets to return to the roster are smaller speed-threat wideouts Curtis Samuel and Damiere Byrd. While both of them missed extensive time with injuries in 2017, when healthy, they open up the field for Newton -- on deep routes and crossers out of the slot -- complementing Funchess' work outside as a possession receiver. Adding Robinson would essentially be icing on the cake for Carolina, solidifying the WR depth chart as an above-average group for the first time in years. Newton has ranked inside the top five in percentage of passes thrown into tight windows in each of the last two seasons, per Next Gen Stats. Robinson's great route-running technique would open clearer throwing lanes for the former MVP and offer him someone who's more than capable of winning those 50-50 jump balls. The Panthers are in the middle of the pack in terms of cap space right now. If they want Robinson's services, they can make a contract work. Securing Newton a No. 1 receiver who's still just 24 years old as the quarterback enters the next stage of his career would be well worth the cost. Robinson's name hasn't been connected with the Colts this offseason, but if Indy moved to sign him, it would make an awful lot of sense. With Donte Moncrief set to hit free agency, the state of the Colts' receiver room outside of T.Y. Hilton is ghastly. Chester Rogers is the only other option with "extensive" regular-season action, and his 42 career catches are more than the rest of the players behind him have in their NFL tenures combined. The Colts hope Andrew Luck returns under center this year, but as things stand today, they're welcoming him back to a hotel that's vastly deteriorated since his last stay. Luckily, the Colts have roughly $70 million in cap space to spruce the place up. Hilton owned a 36.1 percent share of the team's intended air yards last season, while no other Colts player sliced out even 17 percent. There's a chasm in this passing game that desperately needs filling. Robinson would upgrade the Colts' deep attack, which was far too hit-or-miss last year. While Jacoby Brissett posted a 103.3 passer rating on deep throws, they accounted for just 3.6 percent of his completions, ranking 29th out of 35 quarterbacks who threw 200-plus passes. Signing Robinson would not only provide the Colts with an instant upgrade at the position, but it'd mean they pilfered a high-end player from a division rival. Luck's health remains one of the great mysteries in the NFL, but the dream of him piloting an offense with Hilton and Robinson along for the ride is as tempting a reality as one can fathom. The Ravens' complete inability to draft and develop young talent at the receiver position has, once again, brought the chicken's home to roost. Mike Wallace and Michael Campanaro are set to hit free agency next week, while Jeremy Maclin could be a cap casualty after one largely ineffective season with the team. If those three walk out the door, Baltimore is looking at a receiver depth chart highlighted by Breshad Perriman and Chris Moore, who combined to catch 28 of 73 targets last season. While the Ravens haven't shown much ability to hit on wide receivers coming out of college, they have nailed their fair share of veteran additions at the position. We saw a team with a similar history in the New England Patriots admit that last offseason by trading for Brandin Cooks. As a young veteran player, Robinson would present the best of both worlds for a Ravens team teetering on the edge of a transition phase. The team has been fiercely loyal to former Super Bowl MVP Joe Flacco, but whispers around the league seem to indicate that Baltimore might consider diving into the quarterback market in 2018. NFL.com draft analyst Daniel Jeremiah -- a former Ravens scout, by the way -- has Baltimore selecting Oklahoma's Baker Mayfield in his most recent mock draft. Adding a veteran No. 1 receiver like Robinson would make the lives of Flacco and his potential replacement easier. Robinson would help Flacco improve on two of his weakest areas these days -- as a deep-ball (40.2 passer rating last season) and tight-window (35.0) passer. Robinson would make for a fine running mate when the team is ready to install Flacco's successor. Tight against the cap, Baltimore would have to get creative to squeeze a contract for Robinson onto their books. However, don't rule out GM Ozzie Newsome finding a way to pull it off. The storied general manager could effectively leave his organization set with a succession plan at quarterback and fill a long-time hole on the roster in what will be the exec's final offseason at the helm. You can never rule out the Redskins when it comes to a free-agent bidding war. No strangers to diving into the open market with wallets open, Washington could set its sight on Robinson. The Redskins currently have Jamison Crowder and Josh Doctson -- neither a true No. 1 right now -- atop their receiver depth chart, and the cupboard is all but bare behind them. Robinson would provide a Redskins offense in the middle of a makeover with a target it can conceivably funnel the passing offense through. The first question many will have is whether the former Pro Bowler fits with the stylistic tendencies of new quarterback Alex Smith. It's an ideal match if we get anything close to the 2017 version of Smith, who finished first and sixth, respectively, in passer rating on deep (134.7) and tight-window (67.6) throws. The most exciting thing about Robinson joining Washington is his ability to handle the route combinations in Jay Gruden's offense. The Jaguars struggled to get Robinson free from outside press coverage during his years with the team, while few offenses are better than Washington's at creating layup receptions for pass catchers. Kirk Cousins threw 92 percent of his passes the last two seasons in the short and intermediate parts of the middle of the field. With just seven teams having more cap space than Washington, according to Over the Cap, the team must be considered one of the front-runners to land Robinson. He would immediately bring excitement to an offense that was statistically one of the best two seasons ago, but looks vastly different today on paper than it did then.